For this star-studded, collaborative interpretation of the egocentric emperor's sober unveiling, the cast of characters expands to include the perspectives of an imperial physician (as told by Dr. Ruth Westheimer) and a court jester (who else but Robin Williams)--even the emperor's trunks talk (animated by the voice of Calvin Klein: ""nothing comes between me and my Emperor!""). Steven Spielberg, who makes an appearance in the text playing ""the honest boy"" who blows the whistle on the emperor's birthday suit, also pens the book's introduction. 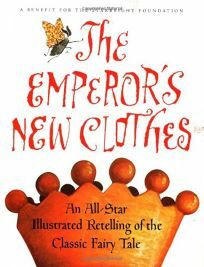 Each character's concise monologue (recorded by the reteller on an enclosed CD) is paired with a portrait, offering the venerable artists here latitude for satiric humor: Sendak's evil prime minister plots the emperor's undoing in the bathtub with repeated images of the crowned man's bare behind on the wallpaper; garbed in white silk bow tie, ruffled cuffs and primped tresses, C.F. Payne's imperial dresser could have prepped the founding fathers; and Daniel Adel's painting of Madonna as Marie Antoinette is a showstopper. As in all such compendiums, some offerings are weaker than others (Do readers really need to hear from the spinning wheel? ), and they might all come off as so many disparate vignettes if not for Blake's addled moth providing the comic visual through-line, transporting readers from one end of the empire to the other. The best jokes can be gleaned from a quick perusal, but the book will likely grace the coffee tables of those who care about the celebrity scene. First printing 200,000; $500,000 ad/promo. (Oct.) FYI: All proceeds from the sale of the book go to the Starbright Foundation, which gives assistance to seriously ill children.